Crucible of Courage is traditionally employed to increase one's confidence and lessen one's anxiety in social situations, whether they involve a job, a stage performance, a love relationship, a family matter, or a school program. We all need courage to meet life's challenges. 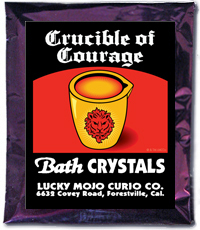 Bathing in Crucible of Courage or using the Bath Crystals as a sprinkle in the laundry water or floor scrub water, is a time-honoured way to embolden yourself to meet any challenge head-on, with power, grace, and strength.